Signs & Symbols The Secret Gateway to Heaven? The Secret Gateway to Heaven? The Heavens and the features in them form a universal symbolic language, since they are the one consistent aspect of the natural world that can be shared by many people at the same time. It could be said that this shared experience is almost equal to the experience of music. Indeed, philosophers have said all the planets and stars do resonate, each playing its own "note" that resounds, collectively, as the Music of the Spheres. The Heavens are seen to be the abode of an all encompassing supernatural superpower. This divine spirit very generously guarantees the fertility of the Earth by raining down upon it, providing heat and light via the clockwork regularity of the Sun, illuminating the darkness with the stars, planets and the Moon. It is also said each of these communicate messages by means of various wave lengths, signs and symbols, such as cloud patterns, rainbows, shooting stars and comets. The next five to complete the 13 are the homes of Gods. The 13th and highest Heaven is the home of the great Mother and Father, the Heaven where babies come from and whence the spirits of stillborn babies return. The Chinese indeogram for Heaventien stands for all that is above the human head. The Immortals lived in a realm so transcendent and so high above that mortals could only dream of its glories, although mythologies all over the world talk of mortals ascending into the Kingdom. For Viking warriors, Valhalla (the hall of slain warriors) was a place of continual feasting and merriment which became the ultimate desired destination after life on Earth. 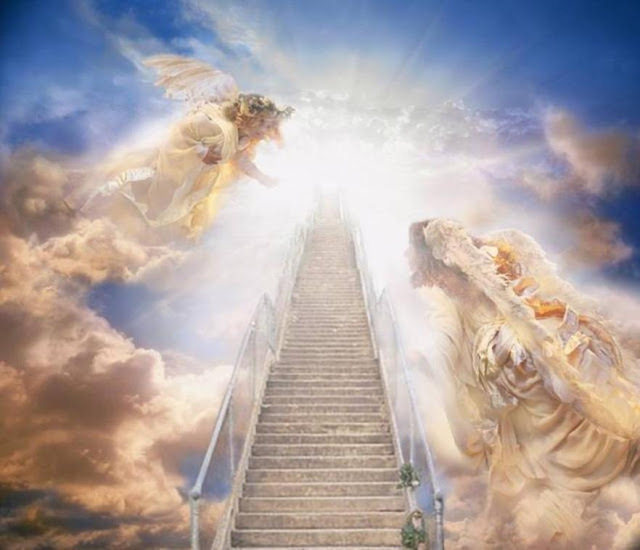 For Christians, Heaven is viewed as a paradisaical place full of angels with harps and the home of the Almighty. In terms of a graphic symbol for the sky, its frequently represented as an arch or vault shape, visible for example in the domed roofs often found in sacred buildings. 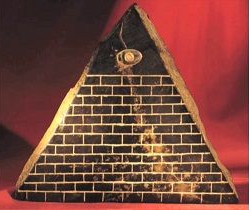 In the creation symbol of the cosmic egg, this dome shape is the top half of the egg, and the lower half is Earth. This original link between Heaven and Earth is a common theme in creation myths and it seems as though man has struggled to reconnect with his heavenly origins. 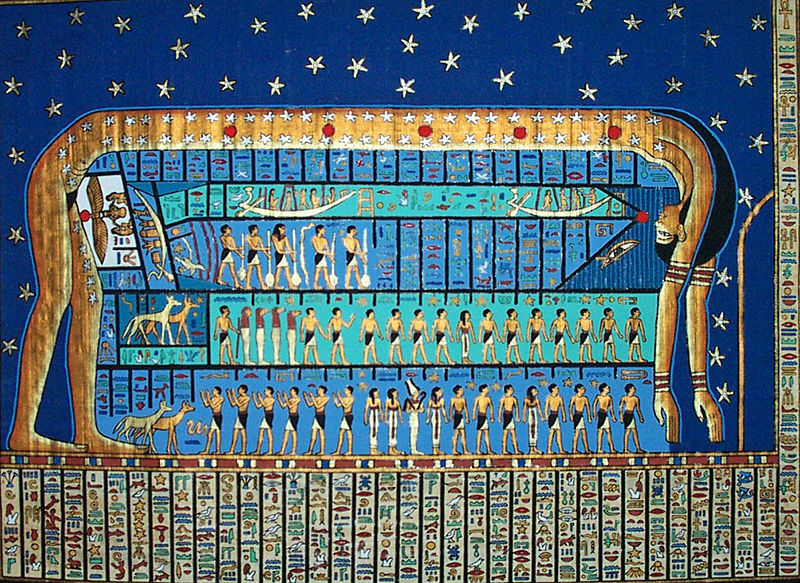 For Ancient Egyptians, the relationship between Heaven and Earth was symbolized by the Goddess Nut, her body forming the arch of the sky with her husband, Geb, representing Earth beneath. For the Egyptians, the fructifying Heaven belonged most definitely to the female principle. This was the Goddess that gave birth to the mighty Sun God Ra. The preconditions for "entry" into Heaven vary according to faith, although there is a very practical school of thought that says Heaven and indeed Hell is what we make of them ourselves.